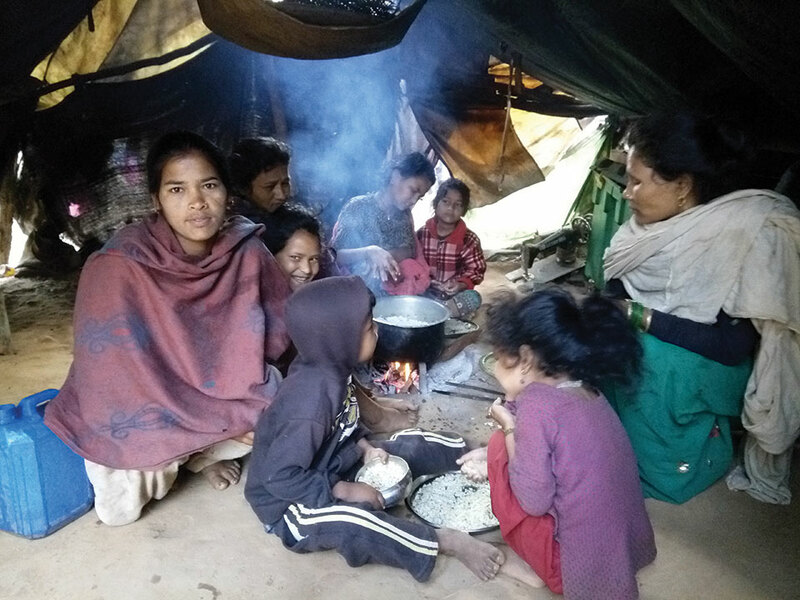 Flood victim Pushpa Pariyar of Galfa camp in Panchapuri Municipality prepares to have meal with her family. SURKHET, March 10: Four years ago, massive floods from Bheri River had completely washed away all the family members of Sarjan Tamatta, a local of Panchapuri Municipality-10 in Surkhet district. At that time, he was in India working as a daily-wage laborer, and became the sole surviving member of the family. Sarjan had lost his wife, three sons, two daughters-in-law, one daughter and two grandchildren to the flood. Since the disaster, he has been living a displaced life in an open ground nearby Galfa forest. His only shelter has been a tarpaulin provided by the government. But now, the tarpaulin has already been worn out and bright blue sky is visible from inside the makeshift shelter. “This is where I live. It can hardly be called a shelter,” said Sarjan. “Now that the winter is over, I don't know how to survive the upcoming monsoon,” he added. Another victim, Dabale Tamatta of Tatapani, shares a similar plight. He lost his two sons and a wife in the floods during the same time. From his family, only he and his youngest son Dharma were the survivors. Their plights too are no different than that of Sarjan. Dabale has been living under tarpaulins, which hardly provide shelter against rains and winds. His son is currently in Birendranagar, the district headquarters, for daily-wage labor. The money sent by him is the only source of livelihood for Dabale. “Life has been really difficult for us. Nobody really cares about us since we are mired in struggle,” he said. The devastating floods of October 14, 2014, had caused the highest number of causalities in the then Tatapani Village Development Committee, which is a part of Panchapuri ward 9 and 10 at present. As many as 110 displaced families from the area are currently living in the nearby Galfa forest under tarpaulins. Since the past four years, Puja Gandrama of Hariharpur-4 has only known struggles and hardships. She also had lost her home to the floods in 2014. “I don't have home and have been living in this camp for the past four years,” said Gandrama. “I struggle to feed and raise my two-year-old son. I too have lost hope of living,” she added. Her husband was working in Qatar with dreams of building a good home and buying farms. He returned home after the floods. However, unable to bear the devastation, he committed suicide soon after. Tul Bahadur Nepali and his family of Lekhparajul have settled in the riverbank of Hataru Khola, nearby Ratna Highway. He too did not willingly settle there, but flood victims like him have little choice. According to him, they received relief materials from various agencies for few months after the floods. “But nobody remembers us now, nobody cares,” said Nepali. His family has been living under a tarp that they received as relief material. But as expected, it has already worn out and does not provide protection against sun and rain. “Taking shelter in this camp is more of a torture than relief. 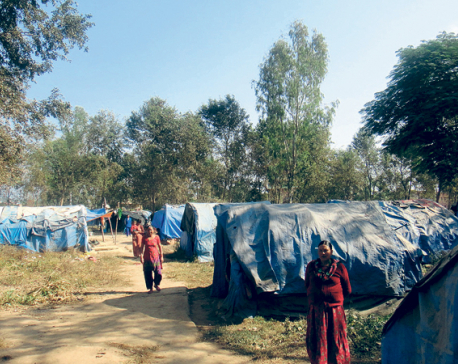 The government should make arrangement for us to leave this camp and rehabilitate us,” said Nepali. There are altogether 18 temporary camps in various areas of the district for displaced flood victims. Their tarps and clothes are already worn out. Their struggles are increasing every day. However, none of the stakeholders have shown any concern for their wellbeing. The flood victims are very disappointed with the government's laid-back attitude for their welfare. With no additional aid and relief, their plights are worsening day by day. “Those who are comparatively wealthy have already left the camps and returned to their village. But for others like me, there is neither food nor shelter,” said Gandrama. The government had provided the flood victims with Rs 50,000 to purchase land. However, most of them have already spent the amount in purchasing food and clearing their loans out of desperation. In lack of land, the government has not provided them with money to build home. Of late, with the formation of local and federal governments, flood victims have become more hopeful. “The people who we elected are now the local representatives and in the provincial government. We are hopeful that they will take decision to help us,” said Bal Bahadur Thapa, secretary of District Flood Victims Struggle Committee. “We would be very happy if they take decision to rehabilitate us in package rather than providing relief,” he added.